Why Savasi Island? With pristine coral reefs and abundant sea life at your door, secluded beaches to call your own, stunning sea views to gaze upon, giant banyan trees to inspire and secret pathways through amazing crevasses to explore. Savasi Island is not only spectacular, it’s also private, beautiful, peaceful and without compare. Savasi Island is an ideal place to unwind. Do as much or as little as you like, we’ll help you slot into your zone of yearning, then we let go and appear when you call our name. Savasi Island is set amongst a pristine and unspoilt region – its hinterland is more akin to what the mainland of Viti Levu was over 50 years ago . If you want a more authentic experience, Savasi is for you. You don’t have to leave your villa to experience incredible vistas as all have uninterrupted views with access to private beaches or pools. Savasi is a special place, surrounded by a natural coral cay on one side, lagoon on the other. The reef has a myriad of colorful coral and reef fish, right there, at your fingertips, right off the beach. Savasi Island’s architecture encapsulate the island environment to a tee. Comprised of six exclusive villas each with their own sense of space and style, ranging from “Hemingway charm” to six star, contemporary Fijian excellence. The Reef Bure is a spacious, well appointed, air-conditioned suite offering beautiful sea views from the private shaded timber verandah. The bedroom features a King sized bed, luxury linen, Pure Fiji toiletries, guest gowns, hairdryer, and indoor-outdoor style shower. Ideal for one couple. The Beach House is located amidst delightful tropical gardens and overlooking your own sandy secluded beach with sun lounges and a hammock. Experience the magic as you watch a beautiful sunset, hear the gentle waves on the coral reef, sip a delicious cocktail and savor every moment. The spacious and charming waterfront Boat House with its private pool is located by a great big beautiful Banyan tree with the sea right at your door! The expansive decks off both the bedrooms and the separate sitting room are wonderful spaces to enjoy and simply “be”. The WOW factor is experienced from the moment you view the Waterfall Villa. Stepping stones across your own lily pond with cascading waterfall creates a sense of arrival rarely to be experienced. With your own banyan tree in the middle of the Villa, and panoramic sea views, you will feel close to nature and enjoy a magical “sense of place”. 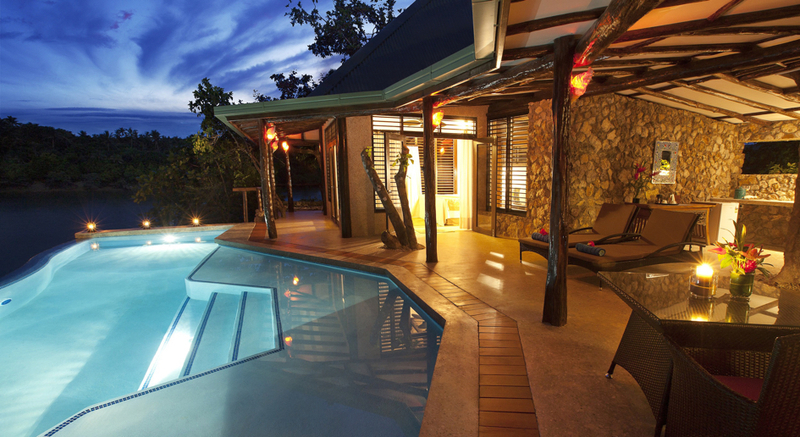 Luxuriate by your own pool, day and night. Too easy to stay put and simply do nothing at all! This beautiful, absolute waterfront Coral Villa, ensconced amidst exotic vegetation features an amazing over-water infinity pool and stunning panoramic views of the ocean from the spacious cliff side decks. The Coral Villa reveals the unique and charming Fijian inspired architectural features of a style which depends on nature and blends beautifully into it. The bedrooms are set between an open-air atrium with water features and bright and balmy outdoor spaces creating a harmonious indoor-outdoor tropical style living. Transfers from the Savusavu Airport to Savasi and return, Inclusive of all meals, All day tea and coffee, A complimentary cocktail per adult per booking, Wireless Internet and iPod dock, Snorkeling gear – masks, fins, reef shoes, Sea kayaks, stand-up boards, mountain bikes and other island activities, Daily housekeeping and nightly turndown. Outside of this just about anything can be arranged! Exchange vows in Paradise in a secluded setting surrounded by the ones you love. It’s a beautiful wedding setting at one of the friendliest places on earth. Your wedding will be designed just for you! Rejuvenate the body and mind with a private massage from the comfort of your villa, the deck, or the secluded beach. Please refer to the Massage Menu for more information. Cultural experiences include a Coconut Demonstration, Fijian Cooking Classes, Fijian Lovo and Meke Night, The Savusavu Pearl Farm, The Savusavu Market and Local Village Visits are all available to Savasi Guests. At sea you can partake in Banana Boat Rides, Sea Kayaking, Snorkeling, Scuba Diving, Reef Walking and Stand-Up Paddle Boarding. Savasi Island also provides an ideal and safe environment to connect with your children, provide them a cultural, geographical and marine experience. They will remember this holiday forever.